A beautifully remodeled end unit which means extra windos to let the sun in or view the falling snowflakes! 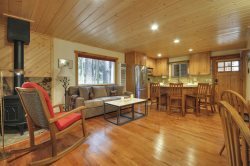 Completely remodeled and well equipped, this end unit is the perfect Tahoe getaway to create your own vacation memories! This 3-story Townhome is one of our most popular vacation rentals. The owners of this condo have had SO much fun remodeling and furnishing this home-away-from-home especially for your Tahoe vacation. The entry level offers two bedrooms (each with a queen size bed and one has a TV), a full bath with double vanity area and a deck accessed through a sliding glass door in one of the bedrooms for that peaceful early morning cup of coffee. Up the stairs you will find an open, sunny and bright living, dining, kitchen gathering room. There is a TV/DVD, (no cable - but there is Roku) gas log fireplace (no wood needed), comfortable futon and recliner, seating for 6 at the dining table along with 4 bar stools. The kitchen has granite counter tops, gas range and is extremely well equipped. On this level there is the 3rd bedroom with a queen bed and also the second full bath. The loft area is good size with a double bed and a hutch with lots of fun games for kids of all ages . This unit has wireless internet. Great hospitality and great place to stay!